The Vizsla, or Hungarian Pointer, is thought to be one of the oldest sporting breeds – a hunter and companion to the Magyar (Hungarian) people. 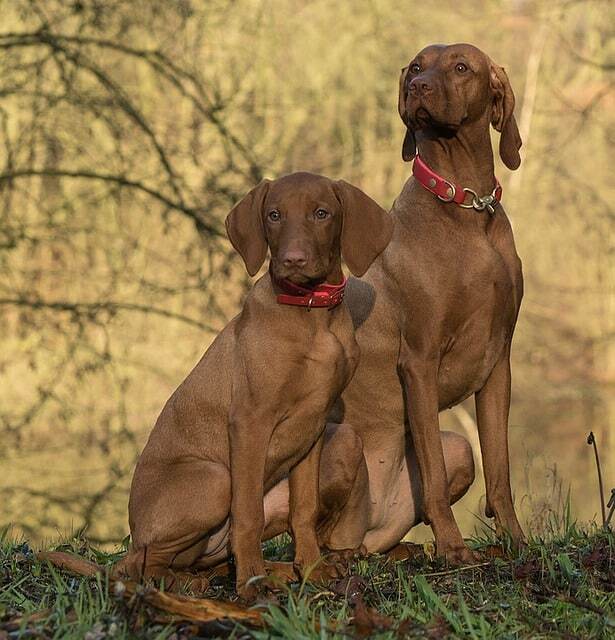 The Vizsla, whose name means alert and responsive, was prized by the land-owning aristocracy for its hunting abilities, its regal appearance, and its warm personality. The Vizsla’s habitat was the Hungarian plains – a warm and fertile region where partridge and other game birds flourished. Between World War I and World War II, the Vizsla nearly became extinct. Hungarians who fled the Russian occupation in 1945 smuggled their beloved dogs out of the country. The Vizsla first appeared in the United States in the early 1950s and was admitted to AKC registry in 1960. Can a Vizsla live in an apartment? Do Vizslas get along well with children, cats, and other dogs? Do Vizslas “mouth” a lot? Do they retrieve well? Are there Vizsla rescue agencies? Other characteristics are more cosmetic such as eye color; but taken together they set this breed apart from all others. The Standard describes an ideal representative of the breed. No individual dog is perfect, but the Standard provides an ideal for the breeder to strive towards. Because of copyright concerns over the collection of all the Standards at any single site storing all the FAQs, AKC Standards are not typically included in the Breed FAQs. The reader is referred to the publications at the end of this document or to the National Breed Club or to the AKC for a copy of the Standard. Vizslas are very friendly, affectionate, loyal dogs that make wonderful family pets and hunting dogs. They need to be treated like a member of the family, preferring to sleep inside and being close to their people. Most Vizslas are lap dogs – with males weighing 55 to 65 pounds and females 45 to 55 pounds – be prepared! They do not make good “kennel” dogs. They should be active, but not hyper. They require daily exercise and will get into mischief if bored. Vizslas are very easy to train, being both intelligent and eager to please. They are sensitive and should not be severely disciplined, but are not “soft.” Vizslas love the warmth and are frequently found basking in the sun. Vizslas are outstanding hunters and will both point and retrieve. They have very sensitive noses, good eyesight and natural enthusiasm for the hunt. It’s fantastic to watch a Vizsla lock up on point – it’s hard to find words to express their grace, beauty, and intensity. Field trials are a large part of most Vizsla club’s activity schedules. Although Vizslas are primarily known for their skill in hunting upland game birds such as pheasant, quail and grouse, they are also used for hunting waterfowl and even small fur animals. Most Vizslas are strong swimmers and should be introduced to water when they’re young. Vizslas have beautiful, soft, rust-colored coats that require very little maintenance. They do shed, which especially shows up against black clothes. They’re clean dogs and have very little odor. There is a wirehaired Vizsla, more common in Europe, but rare in the United States and not recognized by the AKC. Vizslas are commonly known by their owners as “velcro-dogs”. They are very touch-oriented and prefer to be in contact with their people at all times. They will accompany their people everywhere, including into the bathroom and shower. If you do not appreciate constant canine companionship, the Vizsla is not the dog for you. In general, Vizslas are an extremely healthy breed and it is common for them to have a life span of over 14 years. Some Vizslas are prone to skin and/or food allergies. They can be sensitive to the anesthesia used during surgeries and it is recommended that owners consult their veterinarian regarding the use of special anesthesia, such as isofluorane gas, during surgery. Vizslas may be sensitive to other drugs as well, consult your veterinarian for more information. Vizslas are susceptible to hip dysplasia, although careful breeding has kept this problem to a minimum in the breed. All Vizslas that are going to be bred should be x-rayed and certified clear of hip dysplasia by the OFA (Orthopedic Foundation for Animals). X-rays must be taken after the age of 24 months when a definitive diagnosis can be made. If you are purchasing a puppy, make sure that both parents have been OFA certified. Less common genetic diseases in Vizslas include hemophilia, von Willebrand’s Disease, tail defects, and epilepsy. As in any active sporting breed, Vizslas are energetic and enthusiastic. However, the Vizsla should not be hyper. Good breeders take care to breed for a good disposition, intelligence, and personality – as well as conformation and hunting skills. Vizslas do require daily exercise, which should include running, not just walking, and they should have companionship and toys so that they do not become bored. A bored Vizsla can become a destructive Vizsla. Vizslas are extremely agile and can easily clear fences over six feet (and some Vizslas may even be more “talented”). They do require a securely fenced yard. Usually, a Vizsla will not jump high fences to leave his yard unless he is bored or lonely. Vizslas can live in any environment if they have enough exercise, a warm, dry place to stay, and love and attention. Like most dogs, Vizslas who are well socialized will get along very well with children, cats, and other dogs. They love affection and companionship. In general, the more people and animals that are around them, the happier they are. Many Vizslas are known for their “mouthing.” They are very soft-mouthed and like to gently hold a hand in their mouth. Many like to carry articles of clothing and shoes around, like a retriever. Most Vizslas love to retrieve. Yes, almost every Vizsla Club has a rescue committee. Please check for Breed Clubs using the Resources below to contact a club nearest you.